She’s a fan of cheap wine, expensive chocolate and still wants to be a secret agent when she grows up, but she’ll settle for lying on the page. Saying Goodbye to Ruby Tuesday… The pains and joys of writing a series. The House on Camden Square series was the first series I’ve written, and it’s a completely different process to write a standalone novel. At times I found it frustrating, and other times I absolutely adored it. 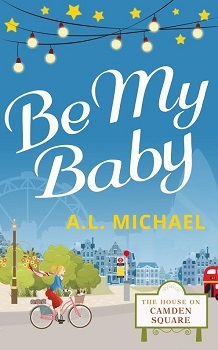 And now Be My Baby, the final instalment in the series has been published, I have to come to terms with saying goodbye to my darling characters, and moving on from their story. Which, after spending a year and a half in their world, is pretty damn difficult. So, the best things about writing a series is you get used to the character’s voices. Those things you really wanted to happen to the best friend, but didn’t really fit with your first book, you know there’s space for them, that they’ll get their own story soon enough. Mollie was the last one to get her story in the series, and that was because she was the quiet one, and she’d become defined by being a mother. To write Mollie’s story was also to write Esme’s story, and balance my hopes and dreams for both of them. I also had to do justice to all of the other characters readers met along the way, say goodbye to them and leave them in a better place. It was a lot of pressure! Sometimes, when you write a book, you wish you could have stayed in their world, hung out for a bit after the story was over, seen them in their natural environment. And in a series, you get to do that, you get to play! You get to come back later and see how they are doing. The downside of this, (and my personal downfall) is the specifics, especially in terms of timelines. As those of you who have read the books will know, they feature flashbacks to the girls’ teenage years. Keeping those timelines in order, and ensuring the timelines line up, especially in terms of ages, is quite difficult over three books, especially if you don’t know what’s going to happen at the end when you’re writing the first book! The joys of writing a series far outweigh the difficulties, however, and I feel really emotional in releasing this final instalment into the world. I hope readers feel I’ve done the girls’ justice, given Mollie and Esme the story they deserve, and allowed them to say goodbye properly to the house on Camden Square.